The Imperial Knights, formally the Knights of the Empire, are an order of Force-users loyal to Empress. They are fully trained in the ways of the Force, and are often considered to be Gray Jedi. 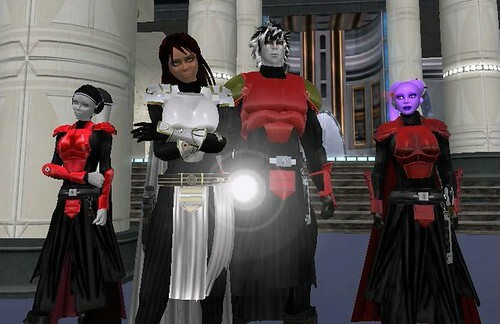 They have sworn loyalty to the will of the Empress above all else, including their devotion to the will of the Force. There was a time when the Knights, under Ardonis Commodore, were more heavily involved in the military side of the Empire, but Master Knight Jetaime has brought the group back to its origins in its number one priority of loyalty to the Empress. They do go on special assignments when the Empress so wishes. Each Imperial Knight carries a standardized silver lightsaber that produced a silver blade. They wear matching red armor. The Imperial insignia was printed on the left shoulder pad and the right gauntlet. The gauntlet was composed of pure cortosis, rendering any lightsaber blade that touched it useless for several minutes. And in victory, we shall receive Honor." All Knights must start at the initiate level to make sure you are right for this group. If interested, please send a notecard detailing your character's history and why you think you would make a good Knight.